Possibly the greatest of all Star Wars vehicles is the mighty All-Terrain-Armored-Transport (or AT-AT for short). Huge quadruped machines that lumber across the snow fields of Hoth or play hide-and-seek on the forest moon of Endor. They are simultaneously terrifying and adorable — like great danes or Duffy Bears. One just assumes that if an AT-AT could talk, it would sound very much like Fezzik in the Princess Bride. Darth Vader: Beware of rebel harpoons and tow-cables. AT-AT: Maybe they try to turn the… tables. Darth Vader: The force is with you, AT-AT, but you are a not a Jedi yet. AT-AT: Anybody want a baguette? 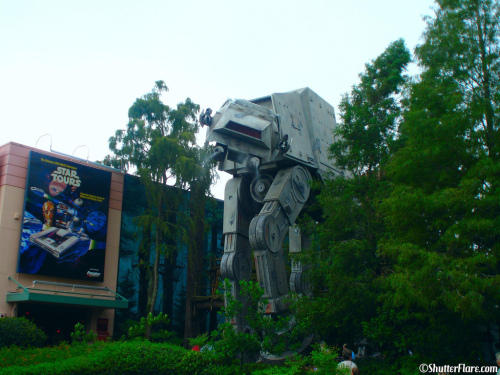 To my knowledge, there is only one life-sized AT-AT on this planet, and it resides in Disney’s Hollywood Studios. It looms over the entrance to Star Tours, and its very presence makes the Walt Disney World Star Tours the best Star Tours. Disneyland and Tokyo buildings are rather plain by comparison. Paris is okay, with its full-size X-wing. But nothing beats an AT-AT. I had a random memory pop into my head today, and it was actually kind of shocking to recall. This AT-AT has been here more or less since Star Tours first opened way back in 1989, which means it turns 25 this year. A few other vehicles have come and gone, including Jabba’s Sail Barge skiff and a full-sized Snowspeeder. But both of those have disappeared, relegated to the Studio Backlot Tour where they are passed off as real movie props (actually, the Backlot Tour is so forgettable now, I’m not even sure if those vehicles are still there). But the AT-AT remains. Since about 2007, the space formerly occupied by the skiff and Snowspeeder has been replaced by the permanent stage for the Jedi Training Academy. Seven years that thing has been there, which means there are second- and third-grade padawans now who have never known life without the Training Academy. It’s hard to fault Disney for repurposing the space. The Academy show is cute with a lot of good Star Wars references–and even more cute when one of the padawans belongs to you. But the addition of the stage (and the various padawan holding corrals) had a trickle-down effect on that AT-AT. To me, it doesn’t seem like that long ago, but seven years actually is a long time. And that is how long it has been since that AT-AT ran out of ammo. Do you remember this? During the heat of the summer, every so often, that AT-AT would fire up its chin lasers and blast jets of water out onto the hot pavement, much to the enjoyment of kids (okay, adults too) on the ground. Just one of the many things at Disney that would squirt water to cool you off. It was accompanied by the sound effect from the Empire Strikes Back (chizz-chig! chizz-chig!) and the laser cannons would power back and forth. The thing actually shot at you! That blows my mind. It’s easy to see why it doesn’t anymore. You can’t have water spritzing a four-foot-high stage where a five-year-old is stumbling around in an oversized cloak, waving a giant stick. That’s a lawsuit waiting to happen. But I just can’t believe the effect has been gone for that long. We still have water squirty things. There’s that Coke Bottle back by the Backlot Tour, the misting Coca-Cola zone in Tomorrowland, the Coke car wash at Test Track. Now that I think about it, Coke really wants you to be wet, for some reason. All they need to do is add a coke bottle to that giant Stitch above World of Disney and they will have cornered the market on uncomfortable soakings. Now our AT-AT still stands in his imposing, er, pose, but he is like a creature turned to stone, something out of Narnia or Greek Mythology or Cher’s face. There is not even a hint that he actually used to interact with you–albeit in a very specific sort of way. Presumably there are still water pipes trailing up his legs into his head. I like to imagine that at night, after the park has closed and everyone has gone to bed, he wakes up and lumbers around the park. I think you can even still see a few footprints embedded in the pavement, if you happen to queue up under the Ewok Village. Maybe he and Gertie the Dinosaur get together and splash around in Echo Lake, or try to play that big guitar at Rock’n’Roller Coaster, or take turns trying on the Sorcerer’s Hat. It’s just the sort of thing an AT-AT would do. This entry was posted in Lost and Abandoned Disney Details and tagged Backlot Studio Tour, Dinosaur Gertie, Star Tours. Bookmark the permalink. I never remembered it shooting water but I do remember it making the sound like it was firing. I haven’t noticed the sound lately but I haven’t been paying attention, I’m usually watching the training academy or R2 when he is roaming around. Is the sound effect still on? As best I can recall, the sound effect has been missing about the same amount of time. Also, I don’t think I’ve EVER seen R2 out. Is that something they just did once or twice during Star Wars weekends? AT-AT shirts of the ironic variety can be found over at Shirt.Woot (among other cheap T-Shirt websites). The problem with ironic Star Wars shirts is that I am helpless against their powers. I must avoid them, or suffer the consequences of a thousand unnecessary t-shirts. I like to imagine him lumbering over to Epcot, then sitting limbs splayed ever which-way watching the Soarin’ video on a loop, wearing Mickey Ears and drinking a Coke out of a straw. Agree that an AT-AT would definitely use a straw. It also might enjoy nosing Spaceship Earth around and barking at it. Great post!!! I never knew that the AT-AT was packing water pistols. What a shame he can’t turn his head a bit and keep on shooting at people. I love the image of it walking around in the dark… Epcot isn’t that far away, maybe it could take a quiet stroll around World Showcase and poke its head in the Maelstrom waterfall. It must be lonely being the only AT-AT in a deserted park. I’m fine with it poking its head in the Maelstrom waterfall, so long as it doesn’t treat the Japan pagoda like a fire hydrant.